A gunman armed with a rifle and a handgun opened fire on members of the Republican congressional baseball team as they practiced Wednesday morning sparking a gun battle with police. House Whip Steve Scalise was shot along with three others and the gunman, who was killed. WASHINGTON — The man who opened fire on Republican members of Congress at a baseball field in Alexandria, Virginia, critically injured House GOP Whip Steve Scalise of Louisiana and a lobbyist for Tyson Foods during the “brutal assault” before he was fatally wounded in firefight with police. 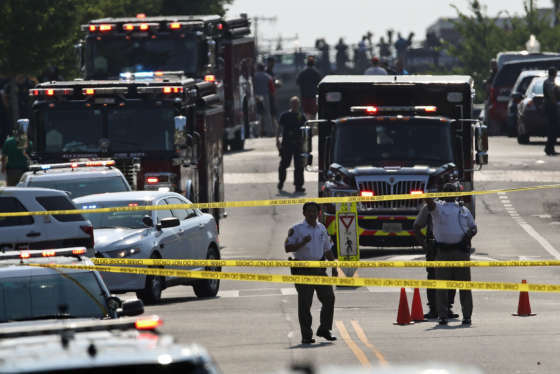 The shooting shortly after 7 a.m. Wednesday came as Republican members of Congress practiced for an upcoming charity baseball game and sent a total of seven people to the hospital, including two Capitol Police officers and a congressional aide. 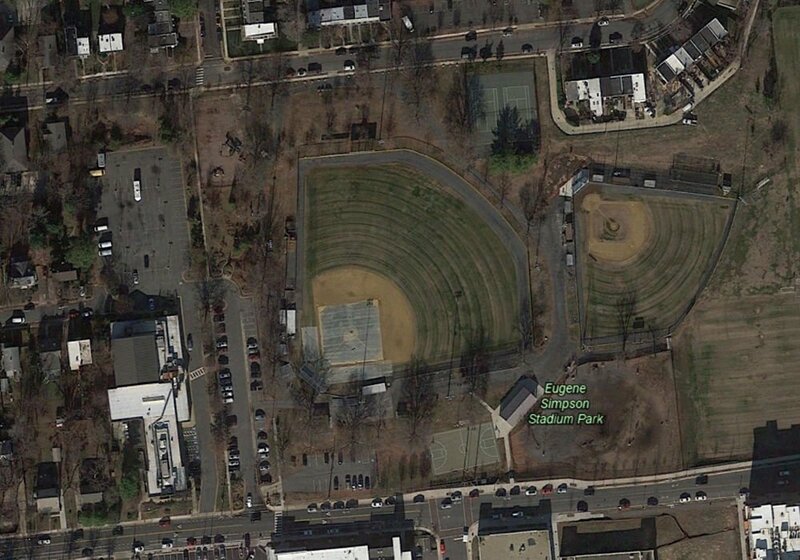 Multiple people were shot at a congressional baseball practice Wednesday morning in the Alexandria, Virginia neighborhood of Del Ray. A second congressman sustained minor injuries and was also taken to the hospital, authorities said. The FBI identified the shooter as 66-year-old James T. Hodgkinson, of Belleville, Illinois. Hodgkinson, who formerly ran a home-inspection business, had been living out of a van in Alexandria for several months and had a history of railing against the Republican Party. Hodgkinson was transported to George Washington University Hospital where he died of multiple gunshot wounds to the torso, said Tim Slater, special agent in charge of the FBI’s Washington Field Office. Scalise, the No. 3 House Republican, was shot in the hip. The bullet fractured bones and injured internal organs. He was taken to MedStar Washington Hospital Center, where he is listed in critical condition. Late Wednesday, hospital officials released a statement detailing the severity of Scalise’s gunshot wound. “The bullet traveled across his pelvis, fracturing bones, injuring internal organs, and causing severe bleeding,” the statement read. In remarks at the White House, President Donald Trump praised the Capitol Police officers and other law enforcement officers who responded to the shooting. “Many lives would have been lost if not for the heroic actions of the two Capitol Police officers who took down the gunman despite sustaining gunshot wounds during a very, very brutal assault,” Trump said. “We may have our differences, but we do well, in times like these, to remember that everyone who serves in our nation’s capital is here because, above all, they love our country,” he said. The FBI said federal authorities were tracing a handgun and a riffle found at the scene and investigators want to know how Hodgkinson acquired the weapons. The FBI also searched Hodgkinson’s home in Illinois on Wednesday. Investigators are looking into Hodgkinson’s acquaintances, recent whereabouts, his social media activity and his motives, Slater said. But it was too early in the investigation to say whether the lawmakers were specifically targeted or whether there was a political motive to Hodgkinson’s assault. “We’re exploring all angles,” Slater said. Hodgkinson was unemployed and moved to Alexandria about two months ago from southern Illinois. He had been living out of a van and spending time around a YMCA. 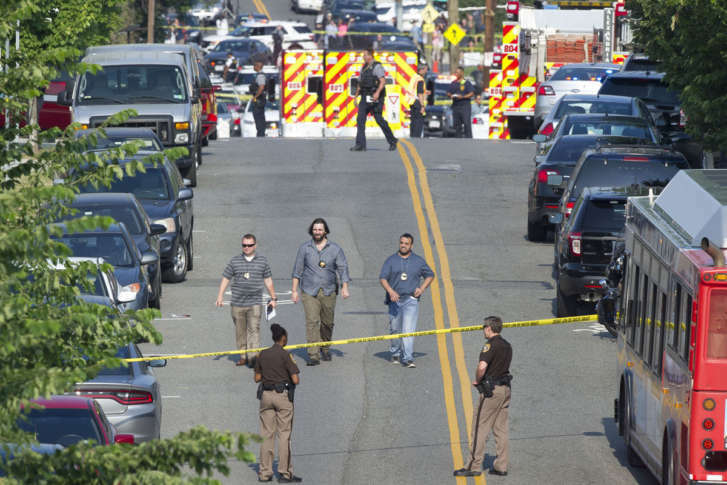 The gunfire sparked panic Wednesday morning in Alexandria’s Del Ray neighborhood where some two dozen GOP lawmakers had gathered to practice for the annual charity baseball game. Alexandria Police Chief Michael Brown said the department received a 911 call for shots fired at Eugene Simpson Stadium Park at 7:09 a.m.
Three Alexandria police arrived within three minutes and exchanged gunfire with Hodgkinson before he was shot at about 7:14 a.m., Brown said. Capitol Police officers, who were at the park as part of Scalise’s security detail, also exchanged gunfire with Hodgkinson. An aerial view of the ballpark courtesy of Google Earth. Two Capitol Police officers were injured in the gunfight. Special Agent Crystal Griner was shot in the ankle. She’s listed in good condition. Special Agent David Bailey suffered a minor injury during the incident and was treated and released from the hospital, according to Capitol Police. Special Agent Henry Cabrera was also at the baseball field but was not injured. Matt Mika, a former congressional staffer who now works as Tyson Food’s director of government relations, was shot multiple times and was in critical condition, his family said in a statement. Roger Williams, a Texas congressman, was hurt in the melee but appeared later on Capitol Hill using crutches. A member of his congressional staff, Zachary Barth, was shot and was treated in the hospital. Witnesses, including lawmakers, reported hearing dozens of gunshots and recalled a panicked scene. Rep. Mo Brooks, R-Ala., in an interview on CNN, said he was on the baseball field near third base when he heard shots and saw a man armed with what appeared to be a rifle. “We had people in the first base dugout who were screaming into their telephones that we were under attack and to send help immediately,” Brooks said. Sen. Jeff Flake, R-Ariz., who was on the baseball field, said in an interview with Fox 5 he saw “gravel bounce up as shots were coming near us” before he took cover in a dugout with others, including the congressional staffer who was shot in the leg. Flake said he saw Scalise lying motionless on the baseball field after dragging himself several yards, but he couldn’t reach him at first because the gunfire was still going on. Ryan and Democratic Leader Nancy Pelosi indicated in remarks to members of Congress Wednesday afternoon that the Congressional Baseball Game would go on as planned Thursday evening at Nationals Park. WTOP’s Hanna Choi, Letese Clark, Amanda Iacone, Nick Iannelli, Kristi King, Rick Massimo, Reem Nadeem and the Associated Press contributed to this report.